Handrail for the front stairs – rather more improvised than planned. I’ll have to re-do this once I find better-looking hardware, but I don’t know when that’ll happen and Winter Is Coming. Been using it near-daily since Spring 2015: The motor could be stronger but otherwise I’ve been delighted with it. Until today, when the motor smoked. And snapped, and crackled. It still works, sort of, giving me time to gather the money to replace it. Fortunately I got paid for roadside brush clearing, so once that’s in the bank I’ll buy another just like it. I have lots of compatible batteries and the next-better one costs twice as much, so it’s not worth upgrading. Until I let the smoke out of it, I liked this little drill. 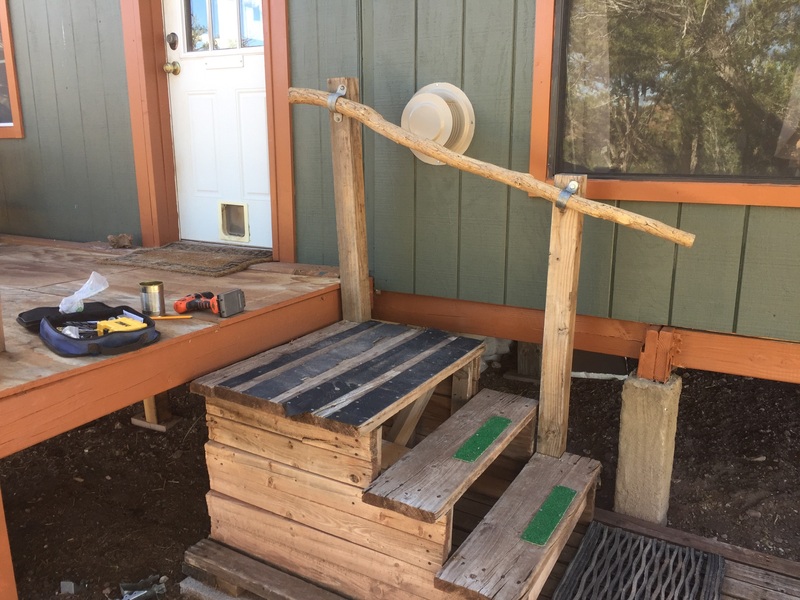 10 Responses to Handrail for the front stairs – rather more improvised than planned. Take a battery with you because when I went to replace mine they had changed the design of how the battery attached to the drill. They were close but not the same. About the rail… If it looks silly but it works, it ain’t silly. About the drill, listen to Zelda. 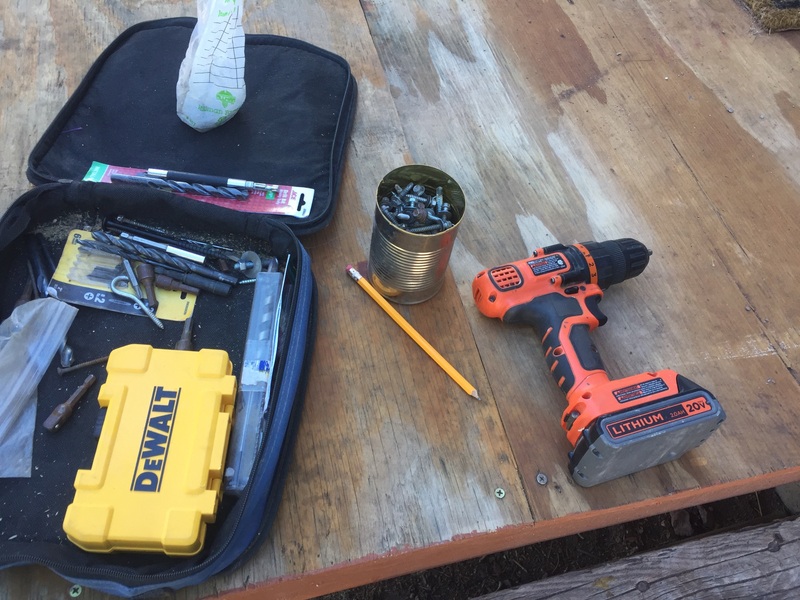 The gang at B&D have been “improving” things, I found that the 18V batteries my drill uses are getting scarce, so there may be a compatibility issue. I had to replace a 18V battery for my B&D DeWalt a month ago, and I had to visit several stores before I could find a battery that wasn’t 20V and that fit my drill. I like that so much I think you should add another to the opposite side of the steps. Of course, that might present entanglement potential for Laddie’s leash during exits for walkies. That was my question too, is the B&D drill 18 or 20 V powered? We can find you a replacement drill easily enough but it might be used or new old stock as the industry has moved on to 20 and now 40 volt stuff. I standardized on Ryobi 18V for all items and that is where it is going to stay in my shop at least. I learned to buy those drills in pairs from my Dad. Not because they fail, but because they are so useful. Drill it’s go in one, screwdriver bits in the other. Saves a lot of time and fussing. My initial (totally useless) thought on seeing the picture: Why is Joel hanging his straw hat outside? Then I got my bifocals. Oh. Duh.